While the wine industry in China has been booming for years now, the industry is far from the simple gold mine that it seemed to be in the past. Those who have lived in China for some time will remember the “grape rush” circa 2010, as many a Frenchman came to cities such as Shanghai, quickly opening up a wine importing/retail company, before just as quickly shutting it down as Chinese consumers were able to buy any grape under the sun from Tmall and China’s other m-commerce giants. A decade ago, a bottle of wine was a mere box on the checklist of middle-class aspiration – a token alongside cheese, coffee and golf – while nowadays there has been a shift to genuine enjoyment, knowledge and, dare we say, oenophilia – while a checklist photo of the wine glasses “cheers” is still a common WeChat sight come Friday evening. Domestic vineyards are proving so bountiful that Chinese wine tourism is set to become a common phenomenon. Counterfeiting is finally being tackled. Trade organisations are allegedly throwing huge amounts of money at borderline unknown Chinese “KOLs” – key opinion leaders – to live-stream themselves drinking particular wines. China’s cup poureth over in terms of demand, with the country set to become the world’s second biggest wine market overall by 2020, and is in fact already leading in the top-end segment, as is revealed below. But what is the state of this unique marketplace? In terms of reaching the Chinese wine drinker whether you’re a national wine group, a label, importer or restaurant/bar, what’s happening in 2018 and what should you know about the “grape wall of China”? In terms of the aforementioned top-end of the market, we can look to Sotheby’s recently released 2017 wine report which shows that China leads purchasing, with 53 per cent worldwide. In terms of highest prices, the results highlight the continued importance of the Asian market: eight of the 10 highest prices achieved were in Hong Kong, five of which were at auction and three of which were at retail. Another recent boon was seen in Hong Kong, as The Burgundy Collection achieved HK$17.3 million (US$2.2 million), far over estimates. Jamie Ritchie, worldwide head of Sotheby’s Wine, commented that, “The Burgundy Collection in Hong Kong concludes a phenomenal first half for Sotheby’s Wine, bringing the year-to-date global total to a staggering HK$423 million, compared to all-year sales of HK$500 million in 2017,” noting that the increase was in part due to “our diverse selection of offerings and innovative sales initiatives”. Newly launched in China – currently available in Hong Kong only – is Sotheby’s “Instant Cellars” a seamless online service which allows collectors to purchase a specially curated selection of wines, handpicked by Sotheby’s global specialists and delivered within 24 hours. Jamie Ritchie explained that “as the wine market continues to rapidly evolve, it has become clear that there is a growing need for additional services that provide advice and guidance, both for those who are just beginning to enjoy wines and wish to build a collection, as well as for those who want to refine their existing cellar”. As well as the big numbers, what are industry experts seeing in 2018 in terms of both taste preferences and how a label can look to fortify their wine in China’s market of enormous opportunity? We spoke with Matteo Cecchetto, brand manager of Fine Wines at Summergate, Johnny Zhang, sommelier of M Restaurant on the Bund in Shanghai, Rachel Jing, brand manager at ASC Wines, and Guillaume Deglise, the previous CEO of Vinexpo. Cecchetto: Recently, we’ve been able to observe that in 2016, orange wines started to appear in fine dining restaurants, while 2017 to now has seen a rise indigenous in grapes, mostly from Italy. Due to the new Free Trade Agreement with Australia, there’s been an increase in the volume and quality of Australian wines. French wines are still top in terms of volume and value. However Italian wines, due to more knowledgeable and curious costumers, are increasing too. Other areas are well-represented, such as Spain, Chile, New Zealand and South Africa. Deglise: Wine has been the hottest category for the drinks industry in China for the last three to four years. Younger people are entering the category en masse as it offers a modern, sophisticated drink. Women also consider wine as a more stylish option than beer. On top of this, wine is the drink that has most successfully penetrated the booming e-commerce channel. Fierce competition ensures low prices and fast delivery, thereby expanding the market. Although France, and particularly Bordeaux, remains the leading exporting country to China, thanks to its perception of quality and reliability, Chinese consumers are more and more interested in trying other alternatives. Australia is now the fastest-growing category, followed by Chile. Both countries have signed free trade agreements with China, which guarantees a competitive advantage compared with European producers, and obviously now compared with the US. There are in fact two markets in China: the tier-one cities enjoy greater education, distribution networks and luxury hospitality. New trends, such as top Burgundy, Rh?ne, Italy or California are growing there. The rest of the country still is loyal to the biggest volume producing regions and brands. On the business side, for those overseas trying to sell more of their wine in high-end restaurants/bars, what is your advice on how to gain more venues and more exposure? Jing: High-end F&B outlets prefer to work with brands that can offer sustainable services – by which I mean a reliable delivery of stock, as well as support on educating guests such as wine tastings, dinners or master classes. Moreover, they want to work with those that can train their staff and coach them on the wine knowledge but also how to sell wines. The various aspects of wine sales – online and offline, on trade (F&B focus) and off trade (retail focus) – all need to be relevant channels. Zhang: This year, our restaurant is equipped with around 20 different glasses of wine in different seasons, for being the recommended house wine. We select the seasonal wine based on its initial characteristics and the previous customers’ preference. At the same time, you can also see our three professional wine vending machines in Glam. On one hand, guests can see how we store wine in the most professional way; on the other hand, they can choose their favourite bottle of wine during tasting. This is one way to be more innovative in finding ways to excite your Chinese customer. Cecchetto: In a market so big, and so fragmented, of course, you need the right importer and related support – but as well as this, create more exposure through wine education. It’s a strong trend for more sommeliers, wine magazines and association to open educational programmes on wine, as well as via promotions and wine dinners hosted in high-end restaurants and bars. Importantly, you need to have your e-commerce strategy fully mapped out for China. Unless you completely understand this, then don’t jump in – alongside your own WeChat account and highly relevant, engaging content and so on, you need to understand all aspects of the e-commerce world in China, and respect its uniqueness. Within F&B, how can a restaurant/bar best serve their affluent Chinese wine drinkers? Are there better ways to present the menu, better selections or price ranges they prefer, ways to get them to enjoy the experience of wine more? Jing: I would that suggest outlets provide a wine list with grape type, tasting notes, detailing the sub-region of the production, and present to the customer whether she/he is the expert or not. Staff should be well trained, especially in general knowledge of the wines being sold to the end consumers. For restaurants, staff should also know their food very well because the more they understand the cuisine, the more sense they have to pair the wines and push the sales of the wines. I think customers will be also love to hear about their food and wine pairing suggestions. 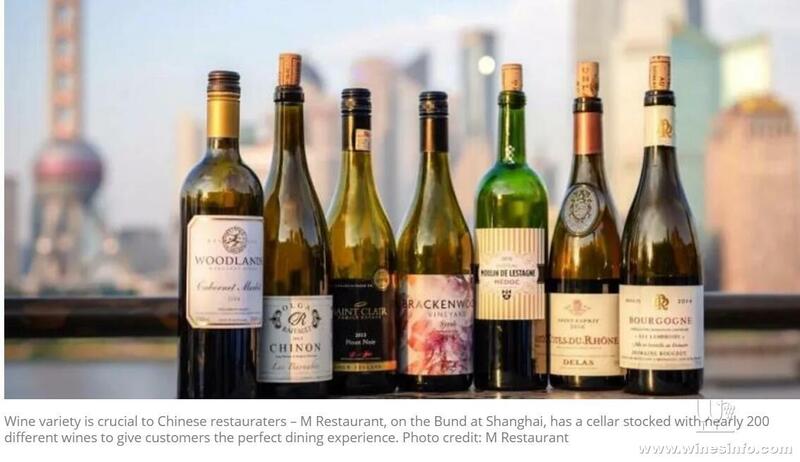 Zhang: Wine variety is crucial to us at M Restaurant – we have nearly 200 different wines to provide the perfect dining experience for customers. In the past two years, the wine list of the restaurant has also been significantly optimised to make it more convenient for the guests to choose wine. The wine list starts from characterising grape categories, and then to present the wine tastes from fresh to rich and strong, finally to demonstrate wines by the pricing – from lower price to higher price – so that in this way, all guests can more conveniently choose their wine types and feel more knowledgeable as they do so. Deglise: China already enjoys a large list of top restaurants with great wine lists. But this is almost exclusively the case in the tier-one cities. An attractive wine list should include a larger proportion of reds than whites, a selection of different countries, regions, grape varieties and prices. Including wine ratings is a plus, when available. And maybe have one or two surprises, like a lesser-known producing country, a sparkling or a rosé wine. A good way to increase consumption and education is to advise food & wine pairings on the menu and to have one or two wines by the glass, to be changed regularly. Cecchetto: On the F&B side, it’s also about knowledge and education – specific pairing menus and having an in-house sommelier are vital for helping sales. In tier one cities, customers want to learn more and experience something new. I can’t stress enough: invest in education, education, education: China has a huge growth potential for the next 10-15 years in imported wines, and the only way to drive sales, exposure and build a solid costumer base is through education: invest double the time and energy in China today than what you would do for other established markets, so that in five or 10 years you can have an established market in China.